This was the question I continued to repeat as we sat in one of the dining rooms at City Tavern in Philadelphia. Of course, I knew the answer. For years we were a single income family with young kids, and City Tavern’s prices are reasonable but not cheap. We had no problem shelling out some extra cash for a decent meal at the Colonial Williamsburg taverns, even with our children in tow, but that was when we were on vacation. Philadelphia is part of the region we call “home,” so it was difficult to justify the cost. Now, however, we’re a two income family and the kids are older so we don’t have to drag them along with us if they’d rather stay home. Whereas exploring Old City used to feel like an event, it’s become more of a spur of the moment sort of thing. Sure, parking is a bit expensive, but no more than what it would cost to take mass transit into town. Having the freedom to pack up and explore is a nice change of pace. City Tavern is located in front of the Philadelphia Merchant Exchange building. Now used by the National Parks Service. 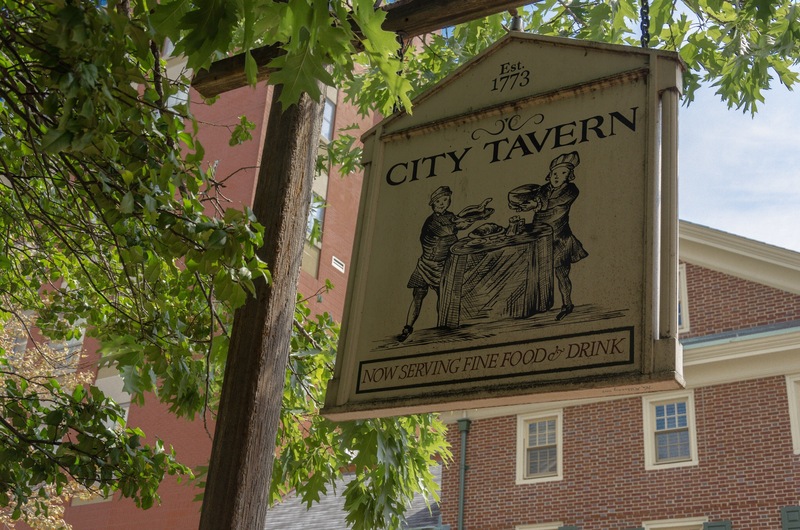 City Tavern has been on our “to do” list for years, and it was nice to put a check by its name at last. The atmosphere was terrific, comparable to a tavern in the aforementioned Colonial Williamsburg. Servers were dressed in Colonial garb, and and the decor and feel of the dining rooms heralds from the tavern’s founding era, Revolutionary America. 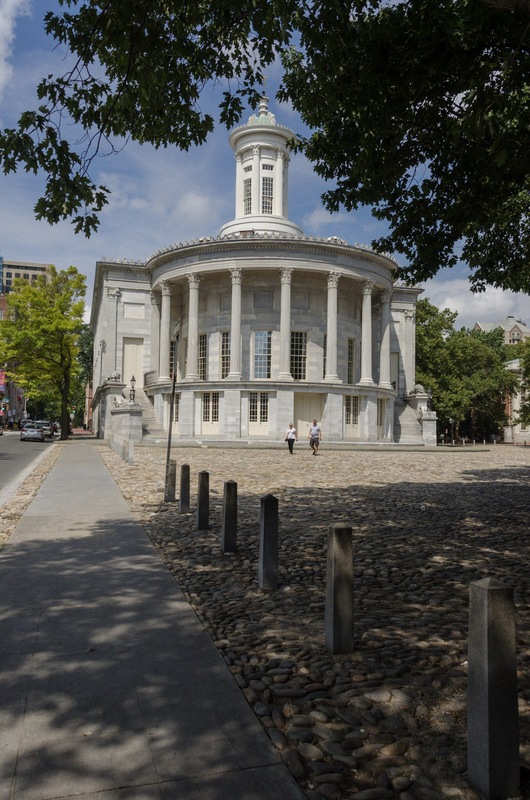 It was actually a favorite haunt for members of the Continental Congress, the Constitutional Convention, and the government of the Early Republic. The place is steeped in American history. The ambiance is not the only draw to the locale however. The food was phenomenal. I ordered pork medallions, “Marinated in Thomas Jefferson’s ale, pan seared, greens, mashed potatoes & vegetable of the season 1.” The mix of flavors was perfect, and the portion was satisfying. Our server, Greg, interacted with his guest in an easy style which added to the charm. And he was quick to respond to any needs we had. If you are ever in Philadelphia, and find yourself exploring Old City, do yourself a favor and visit this historic site for a meal. My only regret about my visit was being unable to photograph the front of the building, as it’s undergoing renovations. But as this means I’ll have to head back soon, I suppose I shouldn’t complain.